Dwejra bay The Inland Sea, Azur Window, Fungus Rock and the underwater blue hole which can only be seen by the many divers that come here every day from so many countries. All the surrounding habitat is a blend of geology, fauna, habitats, shoreline sea scapes, archaeology, flora and history. Not the least a formidable sunset can always be admired from the many vintage points, a place of relaxation, and a photographic location for special photos to show to your friends. This location has long fascinated visitors, artists, geologists and naturalists for its rugged beauty, its scientific interest and its combination of unusual features. An almost circular lagoon of sea water is formed behind a very high rock formation connected to the Mediterranean sea through an opening at sea level which is wide enough to allow the passage of boats. It was formed through a pattern of geological faulting has by time created a fantastic land forms. The lagoon water is not so deep but on approaching the tunnel leading to the open Mediterranean sea, the water becomes deeper. On the outside it drops up to 35 meters. The lagoon is full of pebbles and stones but attracts so many for swimming both locals and foreigners. One other feature of this area is the tranquility, natural features that you will love it. The lagoon is ideal for snorkeling and swimming. It is suggested to stay away from the small jetty and the cave entrance due to the flow of boats. After heavy rains the water visibility becomes nearly zero due to the silt carried by the rain into the lagoon. Fishermen have always used the inland sea as a mooring point for their boats and their huts to store their fishing nets. Boat trips are available to go on the outer area of the rocks up to the Fungus rock, the Azur Window and the natural formation of the rocks along the coast. Dwejra bay is part of your Gozo island visiting itinerary. Dwejra Beach Quality: It is well kept and clean. Beach Facilities: Boat trips from Xlendi are available. Boat trips from the inland sea to go out to the open sea on a trip to visit the the caves and the Azur window. All diving companies provide dives at this area. Gozo swimming: This is one of the locations where people swim in the inland sea lagoon. Less people swim in the open sea since the rocks are uneven and sharp. There is a place close to the Azur Window from where one can have a swim. It is the place from where the divers go down for underwater dives. Getting There: After you arrive with the Gozo ferry at Mgarr harbour, proceed from there to Victoria, the main and capital city of Gozo. It is located in the centre of the island. From there you will find many signs to guide you to San Lawrenz village from where you, then proceed down the valley to Dwejra, the Inland Sea. Gozo taxi, can be recognized from the red on white taxi sign and registration number. This is another way how to get here. Ther are fixed rates to which the drivers have to adher however it would be advisable to ask before you start your trip with the taxi. Public transport: Gozo bus 311 from Victoria up to San Lawrenz village proceed down the valley to this bay. 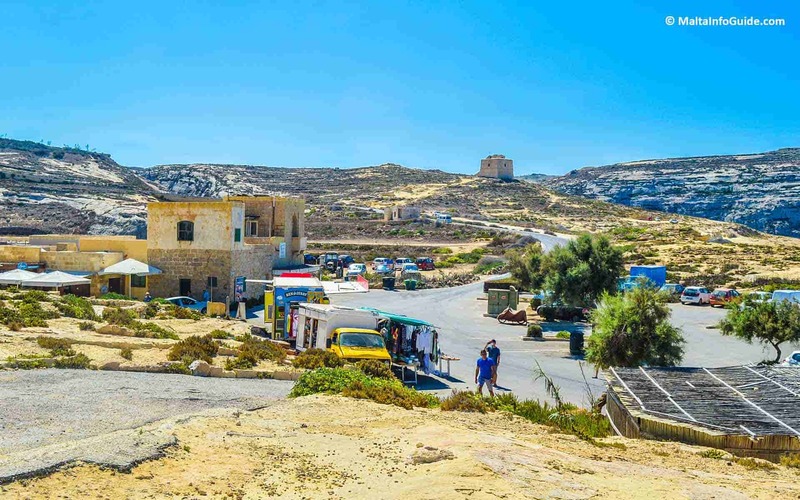 Hop On Hop Off: Offers this location as part of the route in Gozo. Parking: A good parking area is available for whoever arrives in a rented car. Persons with less mobility: There is difficulty to reach the inland sea and the Azur Window, if a person is bound to travel in a wheelchair. There are some viantage points around the area where one can move around with a car and be able to see part of the natural beauty of this area. Rest rooms: They are at the main parking area. Warning: The sea in the inland sea is normally calm. When the sea is rough strong waves enter the arched tunnel which connect it to the outside sea. Beach Furniture: An the inland sea area there are a few restaurants and beach rental services for those who wish to stop for some time resting and admiring the natural beauty of the area. Bar-b-ques: They are not allowed on the beach. Camps: It is not allowed in the area. It is advisable to contact San Lawrenz Local Council. Food and drink: A wine bar & restaurant is located before you go down to the inland sea. It offers a la carte, snack menu, take away and pizzas. A few mobile catering kiosks are available and offer a variety of snacks, cold drinks and ice creams. Closest village: Fontana. It is the village from where you pass to arrive here. Apartments in Gozo: Offers a vast selection of properties both for renting and as a second property. Many are those who have bought a property here settling in this quiet island like a few thousands that have emigrated from other countries. Cart ruts located behind the chapel of Saint Anne. Enjoy your time at Dwejra Bay Gozo.